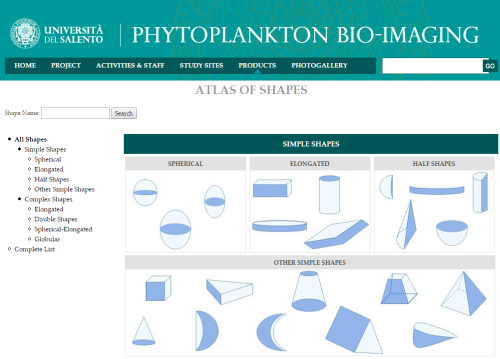 The geometric shape is traditionally used to calculate phytoplankton cell measurements (e.g. biovolume), but it can also play an important role in determining community distributions. Phytoplankton express high morphological variability, both intra- and inter-specific. This has been highlighted by several authors, who have classified a number of phytoplankton species into corresponding geometric shapes in fresh, marine and transitional water ecosystems. This geometric approach is used to estimate phytoplankton biovolume, surface and related fresh-weight biomass or carbon content. This “Atlas of Shapes”, based on the previous research by Hillebrand et al., (1999) and Sun and Liu (2003), Vadrucci et al. (2007), provides a schematic protocol for calculating biovolumes of phytoplankton species, detectable with the Utermöhl method, in transitional ecosystems of the different world eco-regions. A set of 42 geometric models is proposed to be used for the determination of microalgal biovolumes according to the principle of the most similar geometric shape. These shapes were applied at genus or species level. A geometric shape identified with a numerical code was attributed to each taxon. Each organism shape was classified as simple or combined. The phytoplankton bio-imaging atlas is developed by the LifeWatch Italy partners from the Universita del Salento.